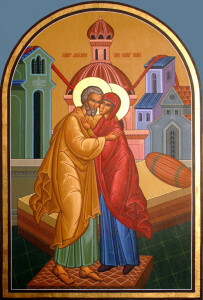 In the Orthodox Church, today is the feast day of Jesus’ grandparents, Saints Joachim and Anna. Being a grandmother (of four little girls, ages one, four, six, and seven) is one of my greatest joys. Although I live over a thousand miles from my granddaughters, I think about them every day. I pray for them. I smile as I look at their pictures all around my office each day and on the refrigerator. I send them letters and gifts. I look forward to Face Time with each of them, and I often wonder what they will be when they grow up. And yes, I imagine spending time with them more often if we retire to Denver in a few years, picking them up from school and taking them to soccer or dance or art classes, having them for sleepovers, taking them shopping, to bookstores and the theater. Since I couldn’t have biological children, my husband and I adopted our three wonderful “kids” who are now in their thirties. We waited seven years after we got married before an adoption agency would grant us our first child. At the time, those seven years felt like an eternity to me. All our friends were having children, and my empty womb cast a sad shadow over many of those early days of our marriage. And then God’s blessings began to come to us as He gave us Jonathan, Jason, and then Beth. I was only 34 when we adopted our third child, but we had been married fifteen years by then, and I remember feeling a bit old. Couples were getting married and starting families younger back then. Imagine how Anna must have felt. She and Joachim had been married for fifty years and were barren. They were often ridiculed by the community—many even said it was their sinfulness that caused Anna’s fruitless womb. (I know that feeling.) Joachim was a faithful Jew who went to the temple and offered sacrifices regularly, giving a third of their income to the poor, a third to the temple, and only keeping a third to live on. Finally God blessed them with a child in their old age. And not just any child—their daughter was Mary, the mother of Jesus. My childhood parish, in which I served as organist as a teen, was St. Joachim (Catholic) Church.